If you are looking for an interesting vaporizer to play around with then there is one on the market that will keep you busy for a while. 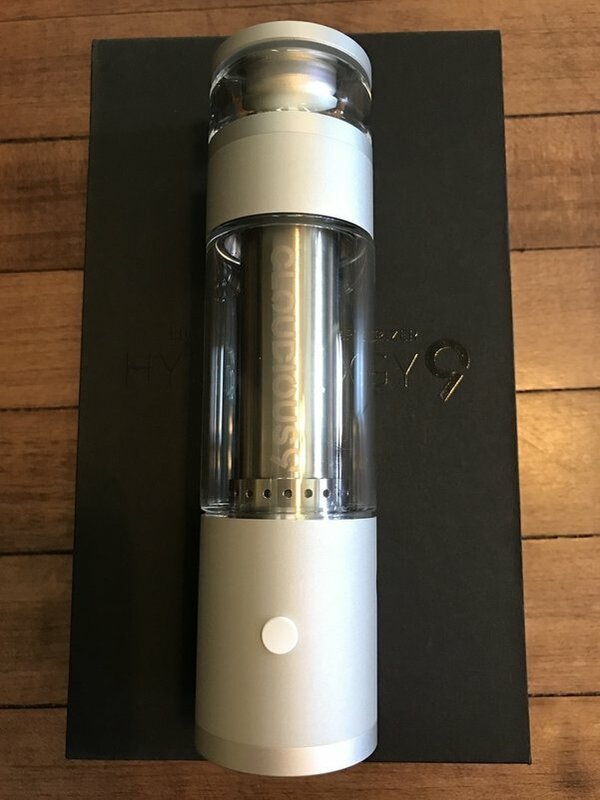 The Hydrology 9 vaporizer from Cloudious9 is one oddly functioning device. 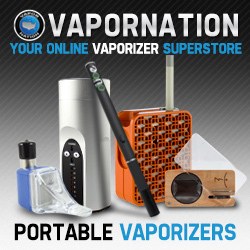 The vaporizer sets itself apart from most of the vaporizers on the market line by incorporating a water filtration system for vaping, directly into the body of the unit, similar to a bong. In addition to that, it also looks and to an extent acts like a lava lamp with its colorful lights. It’s hard to take a vaporizer seriously based on a description like that but rest assured, once you lay eyes on it for the first time, you will start taking it seriously. 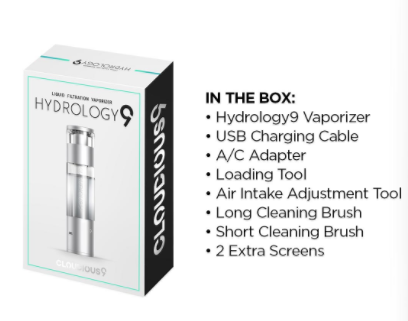 The Hydrology 9 vaporizer is one of the more unique devices I have seen so far in the market for vaporizers and that is saying something because I have looked at over a hundred vaporizers. The market for vaporizers is filled with devices that look uncannily similar to each other and could have the same methods of functioning. Many of the features are also the same and the design language has gotten boring. Cloudious9 probably looked at this market too and decided that it had become too boring so they created the Hydrology 9 vaporizers which would serve as a refreshing innovation in the market. And that it did. Everything about the vaporizer has been designed from scratch and on their own, without borrowing any design fundamental from anyplace else. When the Hydrology 9 came out in the market, it was no surprise that everyone was intrigued by it and in most cases, it took the breath away. You know how there are some things that are so aesthetically pleasing and beautiful that you feel like you just have to have them without even knowing how good they function. 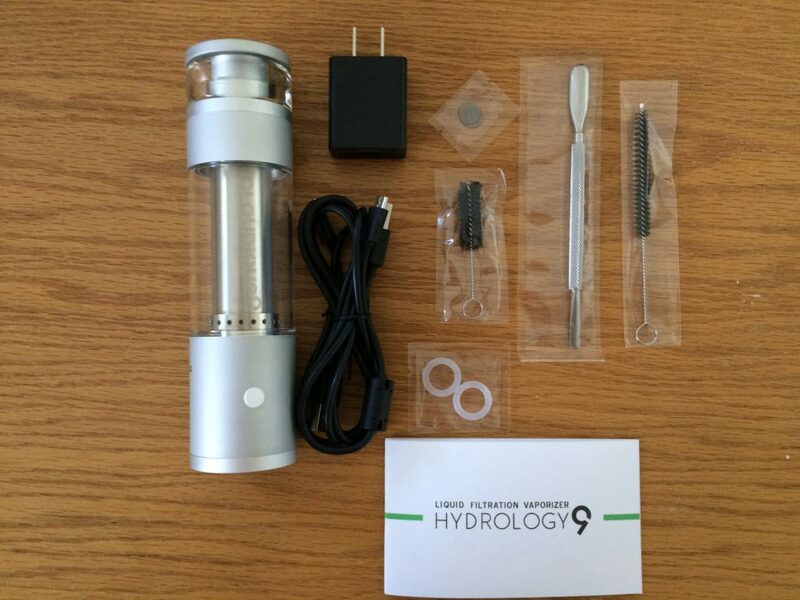 That is the Hydrology 9 vaporizer. The vaporizer is characterized by a combination of polished metal and glass which is exceptionally cool and futuristic to look at. The whole device is shaped like a cylindrical tube much like a sleek looking lava lamp. It’s not as large as a lava lamp though but it is still quite large compared to other portable vaporizers. When fully assembled, the vaporizer stands at a height of seven inches tall. To put things into perspective, the rulers or scales you used in school that were six inches long, so this is one inch longer than that. It does function as a portable vaporizer but it is not the same thing when the size is not that handy. It’s portable by definition only, you can take it around and use it because it doesn’t need to be plugged in to use but with everyone innovating so soon, the word portable has added meanings attached to it. The size has to be comfortable enough to be carried around easily and discreetly is generally preferred. The build quality and material have to be tough so that the device can survive wear and tear while traveling. 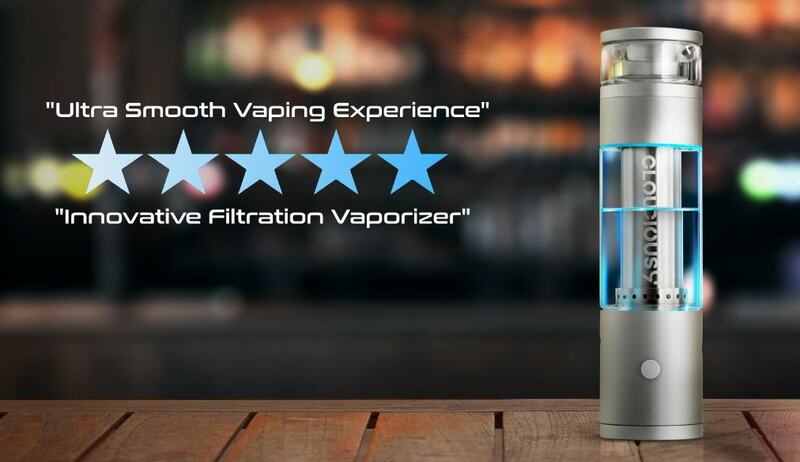 We had the same problem with the Mighty vaporizer but in the case of the Hydrology 9, you can also add the problems of this being a water vaporizer and it is constructed from glass. You will have to be careful when carrying the Hydrology 9 vaporizer around with you because it may have water inside it if you decided not to empty it beforehand. Secondly, there is a lot of glass that has been used in the construction of the device and glass isn’t exactly your first choice for something that you might be carrying around a lot. Remember what happened with the iPhone when it had a glass back. You wouldn’t want to have something in your pocket that might break if you bump into something. The top is made from anodized aluminum and is in the shape of a disc that can be screwed and unscrewed from the top. This is also part of the overall mouthpiece on the device which is made from glass. 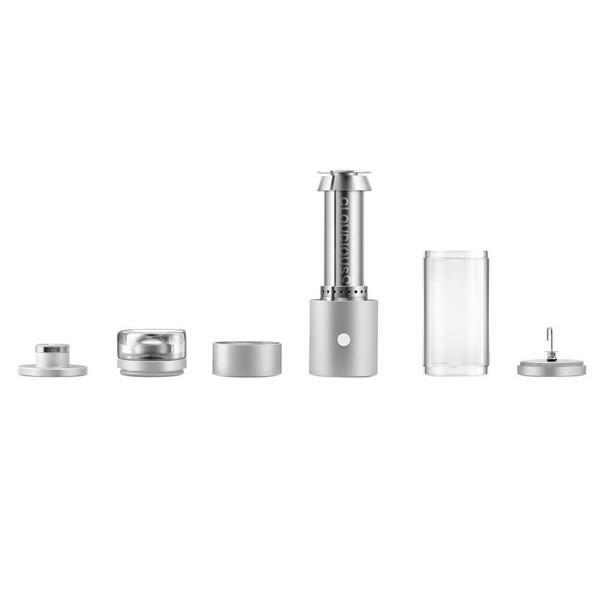 When using the vaporizer you will have to take off the metal cap from the glass mouthpiece before you can start vaping. The rest of the body is followed by glass tubing that contains the water filtration system and the passage from where you inhale the vapor. The air vents are also incorporated into the design here. In fact, the vaporizer has two different air intake vents which can be adjusted to your preferences by twisting them. Lastly, we have the battery housing which is covered by a metal housing instead of glass obviously. Below the battery is the heating oven which can be accessed from the bottom of the device. This is a very unusual setup and to be able to open the heating oven and fill it up with herbs you have to turn the vaporizer upside down and place it on a flat surface. However, the upper cap is also magnetic and won’t fall off so there’s no chance of water spilling out of the device when filling up the oven with herbs. 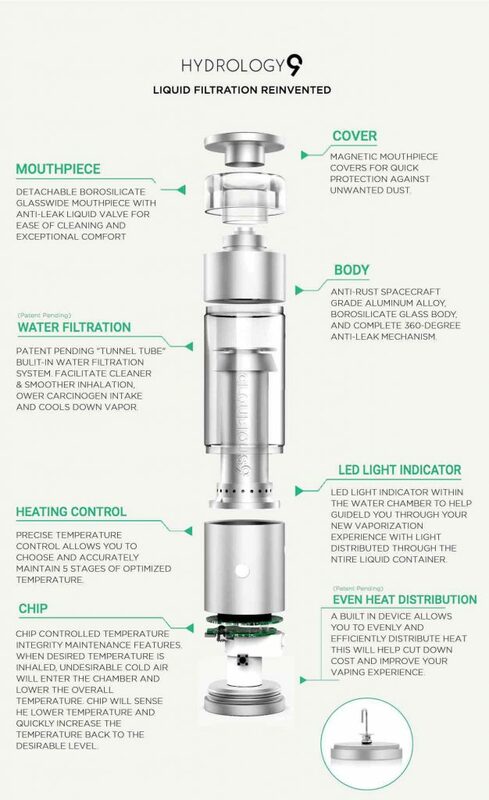 This brings me to one of the more amazing features of the Hydrology 9 vaporizer that make life easier. 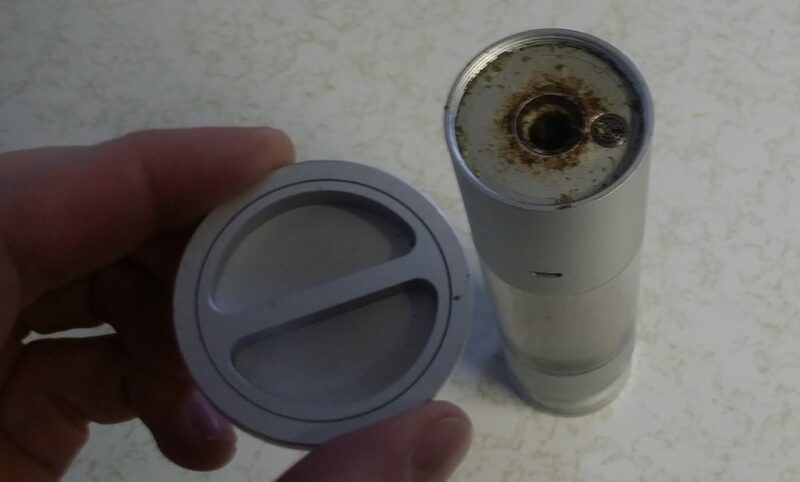 The vaporizer’s oven has a rotating stirrer built inside it! Can you imagine how much easier vaping just got with this? And can you imagine the heating process being so even in any other vaporizer? The bottom cap of the Hydrology 9 has a dial built into it so that can be turned around. This dial is attached to a small metal hook or stirrer that is placed in the middle of the oven. So when you turn the dial, the hook also rotates inside the oven, hence changing the position of the herbs located inside the oven. This not only ensures even heating of the herbs but also makes sure that all of the herbs are completely vaporized and do not get burned or wasted. I love this feature on the Hydrology 9 a lot since now I do not have to shake the vaporizer or stir the herbs with something if I want a good taste from my herbs and if I want to extract the most I can get out of them. So we have already discussed how to fill the heating oven on the Hydrology 9. Let’s go over how the rest of the device works and functions. Once you are done filling up the heating oven, you will also need to fill the vaporizer with water. This can be done by removing the glass mouthpiece at the top to expose the pathway for vapor and the holding tank for the water. You don’t need to fill it to the brim; in fact, the company says that it’s best if you fill it halfway and not more than that. I found that it works best when the water is two-thirds of the whole capacity. The next thing you need to do is turn the Hydrology 9 on which is done by pushing the power button three times in succession. The button is solid and has a nice reassuring click to it, probably due to the expensive material that has been used. The power button can also be used to change the temperature setting when the vaporizer is on. A single press of the button will change the temperature setting so each time you press it, you will cycle through the five temperature settings. The LED lights in the vapor pathway will show you which temperature mode you are on currently through their colors. The lights switch from lowest temperature to the highest temperature in this order; blue, yellow, orange, purple and red. It is useful to have different temperature settings on the device itself but a display on the vaporizer with the temperature being shown to you would have made life so much easier. With these lights, you can’t know what temperature it actually is and it becomes difficult to find the perfect temperature for yourself. This can become irksome because if you have been using dry herb vaporizers before then you are bound to know what temperature ranges you prefer or use and shifting to other vaporizers is easy if they have a display that shows the temperature. With the Hydrology 9 however, you will have to experiment a little. 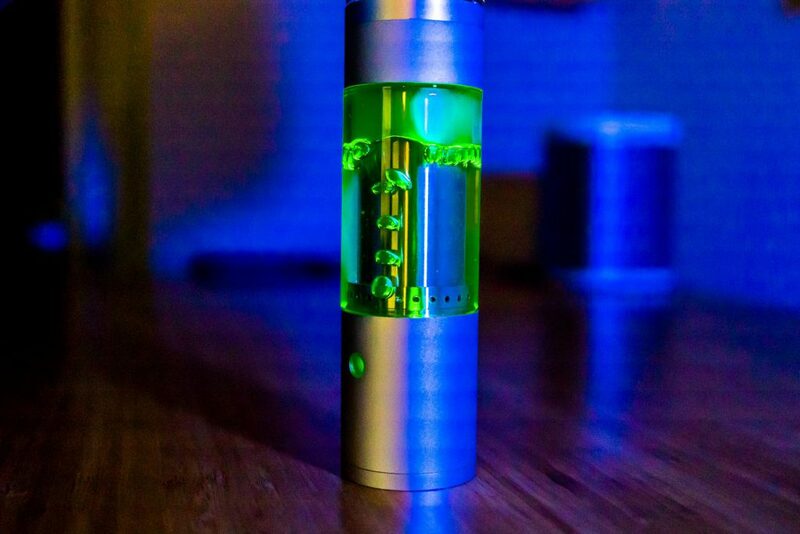 This brings us towards the actual vaping experience of the Hydrology 9. The vaporizer gave us mixed reviews when we used it to smoke some herb. Since it uses a water filtration process through which the vapor passes before it reaches us we expected the vapor to be of high quality in every sense; density, flavor profiles, taste etc. However, our expectations were short-lived and we got an exceptional performance in some areas while in other areas it was just plain average or worse. The draws from the glass mouthpiece are really smooth and that is probably because of the adjustable air vents. The hits are equally smooth as well due to this. The flavor was really good at the lower three temperature settings but after those, it just started to worsen. Now, we were getting smooth hits and good flavor from the vaporizer, at least on the lower three temperature settings but the vapor density that we wanted was not there at all. It became a little average on the higher two temperature settings but then the flavor profile started getting ruined. This left me in a dilemma before I decided that I would only use the Hydrology 9 occasionally. Finally, we come to the battery of the vaporizer. It comes fitted with a 2000 mAh lithium battery which takes between two and three hours to fully charge up. On a full charge, it will last you up to fifteen full sessions which is not much when compared to other vaporizers. The Hydrology 9 also takes 60 seconds to fully heat up its oven and reach the desired temperature which is a much better time than other vaporizers. Also, the oven has a microchip installed in it which senses the temperature and provides heat accordingly. 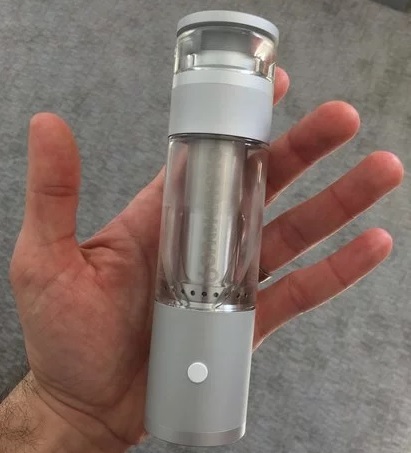 The Hydrology 9 is one odd but really cool looking vaporizer and due to its different approach to vaporizing dry herbs, it has some drawbacks and some advantages as well. Overall, it’s amazing to look at and I wouldn’t mind displaying it in my living room but when it comes to performance, I would not use it as a daily vaporizer. I would, however, still get it for occasional use. You can get one for yourself at this reputable online retailer that sells the Hydrology 9 for a fair price and fast safe shipping. The Hydrology 9 sounds like a piece of art! I have a question. How do you compare the vapor to drawing a hit from a bong? A good bong should give you a cool, comfortable draw. Does this vaporizer make it even cooler and more comfortable? I am asking this because I have never uses a vaporizer. It would be nice to have something that is very easy on the lungs. I have to say that if I were in the market, I might steer toward another vaporizer. This one looks great and seems to have bells and whistles but the drawbacks may outweigh these. Anyway, thank you for a thorough post! Vaporizers in general are usually a lot easier on the lungs than using the bong. Mainly because your not heating the herb to the point of burning anymore. Burning the herbs puts off much more tar and other harmful particles that your lungs don’t appreciate. The hydrology 9 does keep the vape a bit cooler and it is one more filter, the water, process to keep contaminates from getting to your lungs. But I wouldn’t just buy this one unless you really like what it has to offer versus other quality vaporizers.